In an episode of the children’s show aired on Thursday, Piko-Taro, enacted by DJ-comedian Kosaka Daimaou (Kazuhiko Kosaka), appeared in a segment together with Elmo and Cookie Monster. Both Muppets danced to the tune of “Cookie-Butter Choco-Cookie” (CBCC), a song inspired by PPAP. 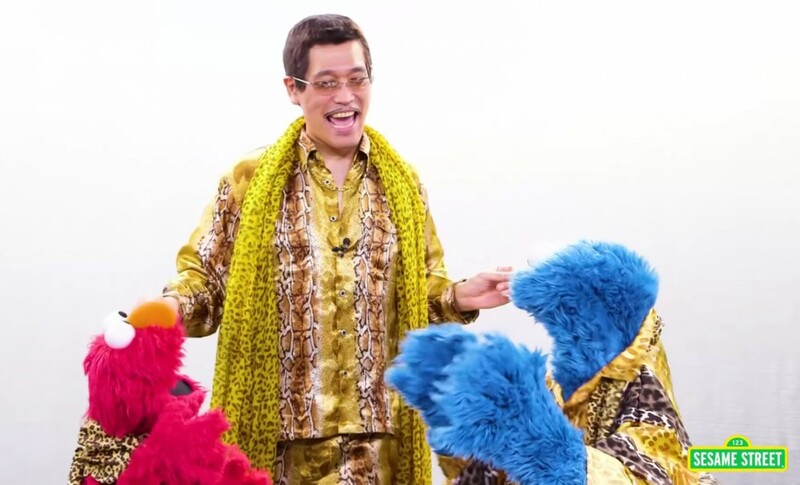 Afterward, Piko-Taro, clad in his signature yellow leotard suit and scarf, joins them and meticulously teaches Elmo and Cookie Monster the basic dance steps of PPAP. With lyrics like “I have a choco!””I have a cookie!” and “I have a butter!,” Elmo and Cookie Monster carefully follow their teacher’s instructions. The perky Sesame Street duo danced and sang CBCC again, this time with Piko-Taro as their backup. After their performance, Piko-Taro glances at his watch and bids adieu to Elmo and Cookie Monster, despite pleas from Elmo to stay with them. The video has been viewed 90,000 times as of Monday. Just a day after, Piko-Taro danced in a fanciful earworm of “PPAP” and “Axel F,” another hit ditty in Japan.